Meadow Road is one of the Star Sprint courses found in Mario Party 6. Meadow Road is a picturesque landscape composed of meadows laced with flowers, a hillside in the background, and a dirt track leading through it. Small trees and red mushrooms can be seen growing along the sides of the trail, accompanied by wooden fences. Sometimes large rocks and stumps block parts of the trail. The trail also passes a small hill with a giant log, and a wooden bridge. The place is largely inhabited by Monty Moles. When the minigame begins, a star can be seen floating down from the sky. The player's objective is to take the star and bring it to the other side of the trail, using various commands spoken into the microphone. The player has to dodge the obstacles and make use of the Dash Pads along the way to reach the goal as fast as possible. 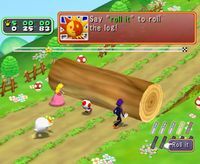 While doing so, the player needs to get rid of the giant log on the trail by summoning the other characters and using the "Roll it" command, as well as to reset the wooden bridge by using the "Run" command on a cylinder-like contraption. This page was last edited on December 13, 2017, at 16:38.